A Picture Card Learning System replaces all your physical flash cards. Designed by professionals specifically for those with autism and other special needs. Used by SLP's, BCBA's, Teachers, and Parents to provide custom picture card instruction. ** Includes a starter set of stunning, high-quality images and 60 exercises created by a certified assistant behavior analyst! Additional libraries with over 4,400 additional images and lessons are available for purchase from within the app. 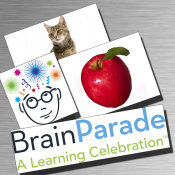 *** Now you can access the Brain Parade® Community with thousands of lessons shared by others.
? See the positive press on See.Touch.Learn. at www.brainparade.com/about/news-press/ ? Here are just a few of the benefits of See.Touch.Learn.? + Parents love See.Touch.Learn.™ because it is designed by professionals specifically for children with special needs using the latest technology, plus it is affordable, portable and effective. + Professionals love See.Touch.Learn.™ because finally a company has designed education tools with the professional in mind, using the latest technology instead of the tired old devices of the past. + Students love See.Touch.Learn.™ because it is fun to use, and built on the hottest technology device. It is so intuitive that children know exactly how to use it without any lengthy instructions.
? The Brain Parade� Community ?
? Leverage the power of more than 330,000 users from 104 countries and choose from over 1,000 new lessons shared by others.
? Improved user interface and Search capability ?
? Scrolling rows display your lessons and libraries.
? See previews of your lessons and libraries.
? Better organization tools ?
? 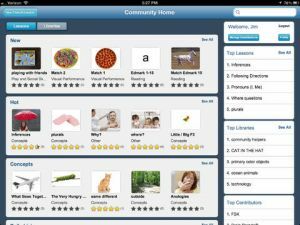 Organize lessons and libraries according to subject, skill level, creator, and lesson type.
? Create folders to organize your lessons and libraries.
? Add comments and descriptions to your lessons and libraries.
? Create multiple libraries of your own.
? Easier lesson creation ?
? Search for images by description or keyword.
? Drag and drop images directly into your lessons and exercises.
? New ?Play Mode? ?
? The new ?Play Mode? let?s you restrict access to your See.Touch.Learn. content and prevent your students from making changes to your work. Una aplicaci�n con muchisimos y muy buenos resultados, la gran dificultad est� solo en ingl�s. a�n as� para usarla de manera indiviidual con alumnos con dificutlades importantes es imprescindible.